1 drawing on paper ; image 7 x 6.5 in., on sheet 8.5 x 8 in. 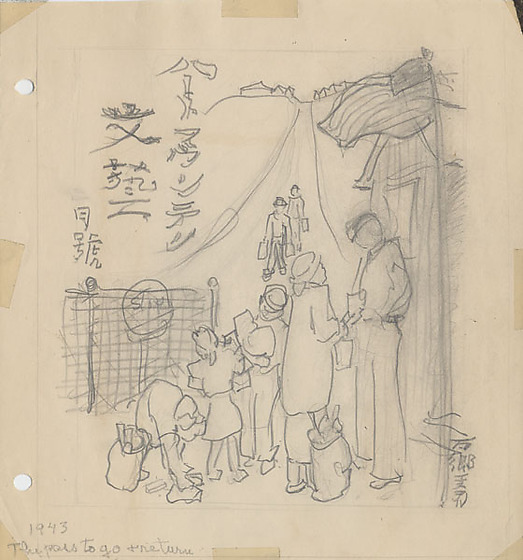 Pencil sketch of a family at guard gate trying to leave camp in 1943. 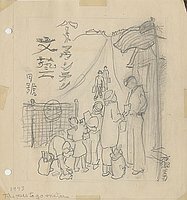 A woman with three children holds a piece of paper in hand as she faces the guard in front of guard house on right. An American flag flies above, top right. Children hold packages and pick up items on ground. On left is a gate with stop sign sketched. Midground a couple of people approach down hill carrying suitcases. Buildings appear on hill in background. Japanese characters (katakana and kanji) written in upper left translated: Heart Mountain literature. Two holes punched along left edge.